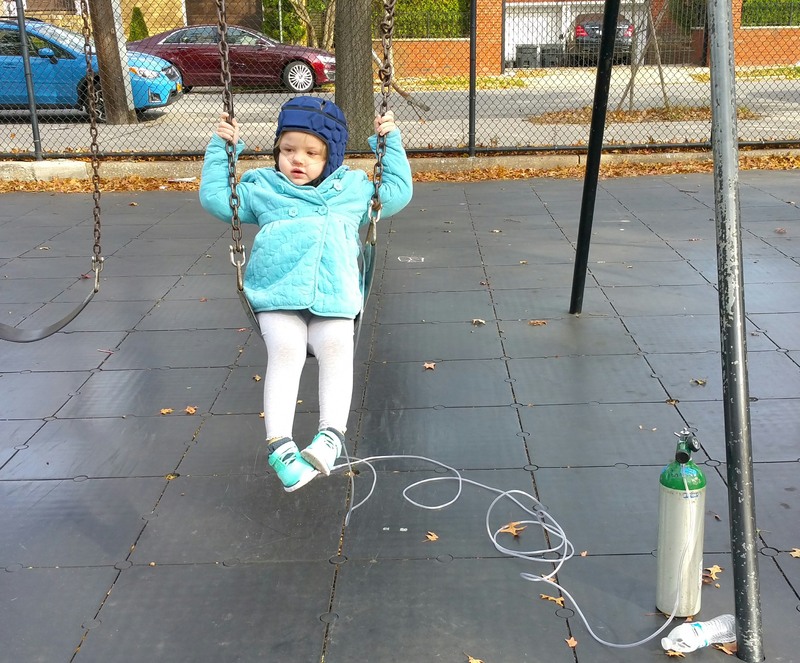 One of her few trips to a playground this fall due to several health issues. Wow, went to write this and realized we haven’t posted an update since the summer. It has been a crazy and busy couple of months with ups and downs. In a lot of ways Sally is still in the same place that she was in our last update. She’s still on oxygen support 24/7, still having daily seizure activity and we’re still working with her developmental delays. There’s other updates that we’ll get into below. First off, we moved to our new home on Sally’s birthday in September. Special shout out to all of our friends who helped us pack and move, Sally was hospitalized the week prior and we were way behind. 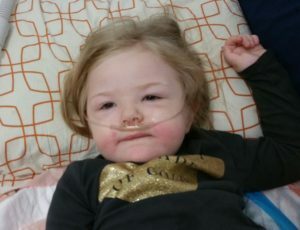 We’re only a few blocks from our old apartment, but the change has been such a positive one in caring for Sally’s needs. Having a garage allows us to more easily move all of her medical equipment in and out. Being able to do laundry in our home has been ultra convenient now having a washer/dryer (which we still dote on), especially with Sally’s current GI challenges (more on that below). It’s insane to think that we made it through two years of Sally vomiting/pooping up to 20x a day going to a laundromat two blocks away. We also keep most of Sally’s toys downstairs, so when she gets to go down there, it’s like a mini-adventure for her. We’re now on the first floor so taking Sally for a walks, getting her outside and on the bus has been so much easier for us (and our backs). We’ve updated our address here. Speaking of school, after weeks of battling to get her a 1:1 nurse (and a spot for her on the school bus) she was finally able to start at her new school on the Upper West Side of Manhattan. All summer Sally wasn’t able to attend school and wasn’t getting her therapies, which left her with low energy/ambition. Since starting school she’s been much perkier, funny, outgoing (herself) and has been doing well there. 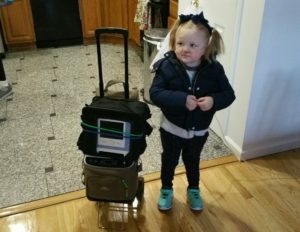 Every morning she boards the bus with her nurse, her CPAP machine, her new oxygen machine and her book bag. 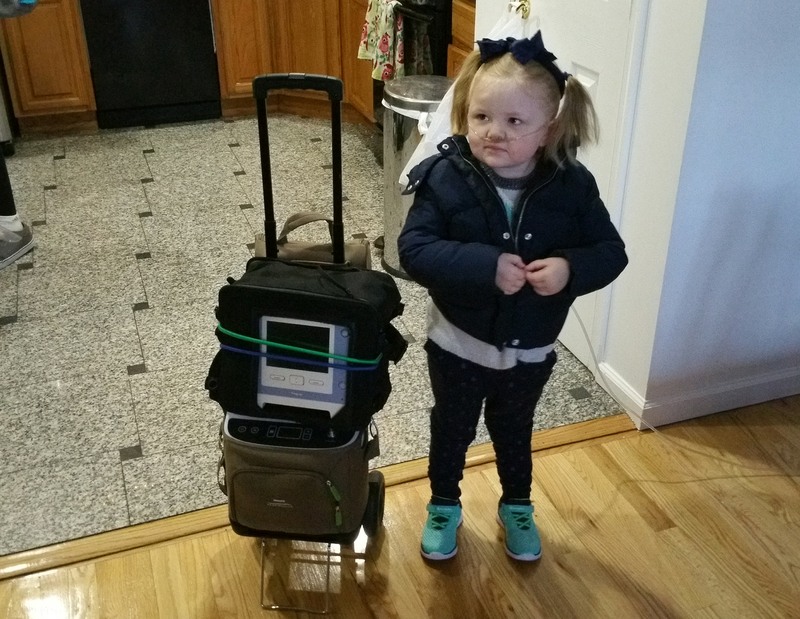 Up until last week were were lugging O2 tanks everywhere with her, the new portable oxygen machine replaces those. Daddy is especially happy after having a tank fall on and break one of his toes. The medical equipment she takes on the bus with her, along with her book bag and another supply bag. Seeing her classroom for the first time. As mentioned above, Sally is still status quo on many things, which is a blessing in itself. She’s still on the ketogenic diet for seizure control, and we’ve been trying to get more fat into the diet. 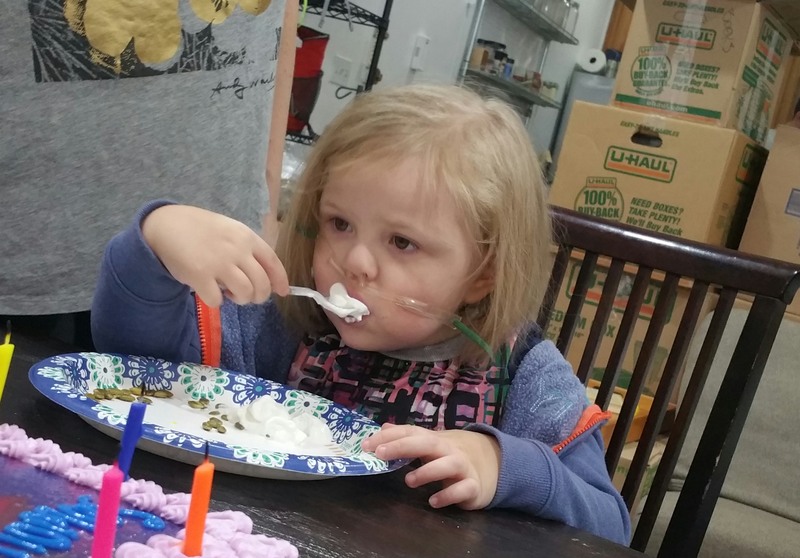 We have to push a measured amount of ghee through her feeding tube based on whatever meal she eats along with an enzyme to help her digest it. Eating is still a battle, she really only eats cheese, berries, eggs and chicken, and we do our best to have her eat small meals every 3 hours. We do still have to give feeds through her tube to supplement her. She has had some new challenges that we’re continuing to work through, one of them being GI issues. She has had significant amounts of stooling the last few months, to the point where we often leave her pants off at home and have her sit and sleep on a wee pad. This brings back memories of her on cancer treatment. and where the previously mentioned washer/dryer have been handy. She has also been going through periods where she’ll scream in pain for up to an hour after going to the bathroom, and often has blood in her stool. We ended up in the ER twice in October with fevers and abdominal pain. One of her hospital stays this fall. Between that and her continued breathing issues, Sally underwent a endoscopy/colonoscopy/bronchoscopy at Cornell Medical Center. We’ve been trying to do this test for months but she kept getting sick. We were admitted a few days before, but knowing the importance of the test the doctors agreed to release her so she wouldn’t miss it again. The Broncohoscopy revealed two bacteria infections called Pseudomonas and mycoplasma. The water they extracted from her lungs should have been clear but came out cloudy, and it was noted her lungs had pus in them. She was put on two antibiotics to treat the infections, one of which could have potentially turned her teeth black permanently but fortunately didn’t. Even after treating those infections she still requires oxygen support. Clinically, doctors are unsure why Sally has breathing issues. 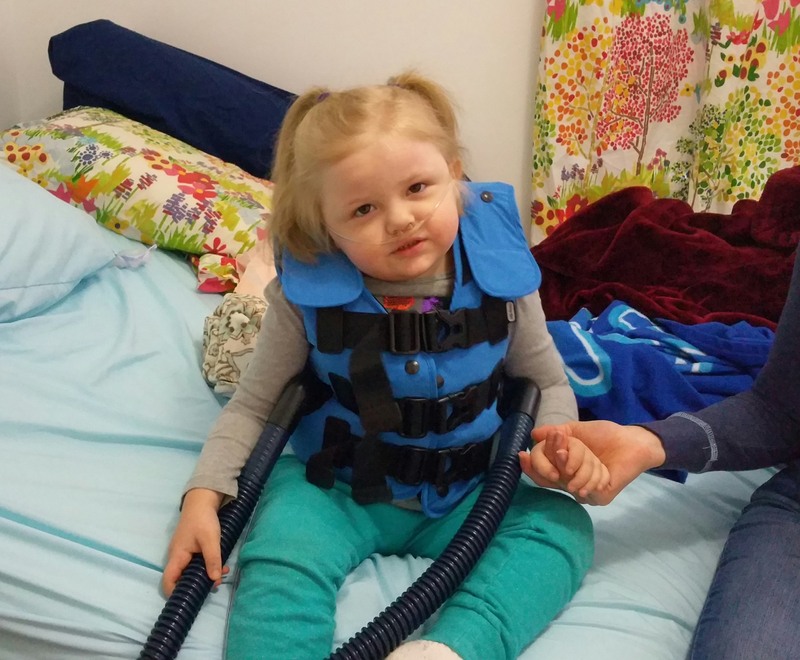 We got approved for home chest therapy, which is a vest Sally wears that vibrates and breaks up any mucus building up in her lungs. The machine just arrived and we started using it this weekend. Trying out the chest vest. As we awaited the other results, Sally had her first meeting with the Long Term Followup Team at Memorial Sloan Kettering. 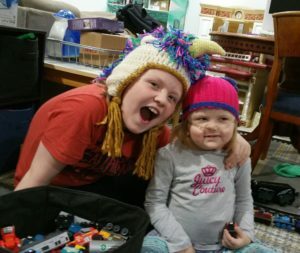 This usually occurs 5 years after cancer treatment, but she was entered early into the program due to her health issues. We honestly were just expecting a quick meeting, but instead Sally underwent a battery of tests. Her EKG revealed a QT Interval in her heart, which is a serious condition. It was noted that Sally showed signs of it at the beginning of treatment, but was never flagged. 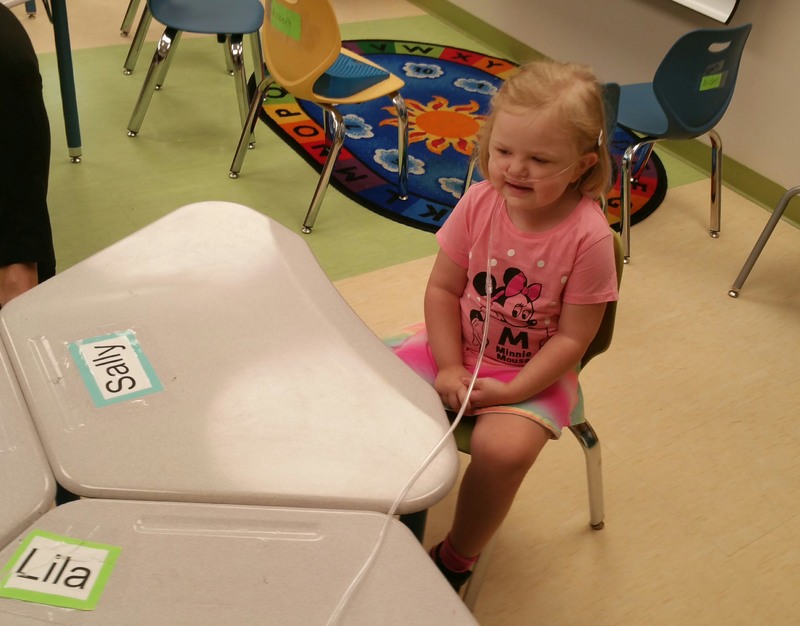 We had a couple of nerve-wracking weeks where Sally was almost admitted after a follow-up EKG confirmed the results. 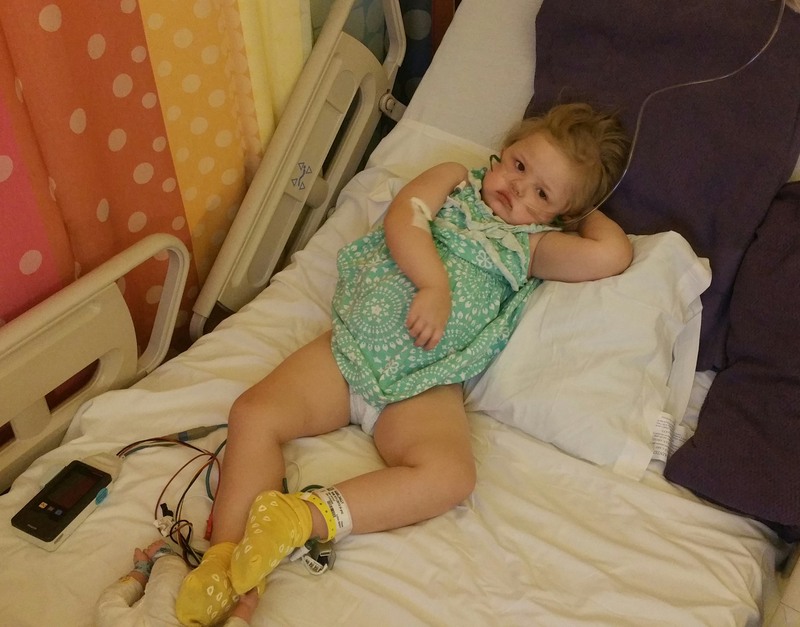 After a third EKG her levels returned to normal, and it was decided that certain infections and medications can bring it about, and is something we’ll have to monitor going forward. We recently just got the colonoscopy/endoscopy results back. Sally’s GI doctor said that her digestive tract is inflamed, but is unsure of the cause. It may be from the various infections she’s had over the last few months, or it may be the early signs of inflammatory bowel disease. He wants to wait a few months and repeat the procedure, which we have scheduled in February. Sally was puffy from IV fluids after her tests. So after all the tests doctors are unable to clinically diagnose why Sally needs to be on oxygen, why she’s having GI issues, why there’s blood in her stool and why she’s been screaming in pain. In the meantime we’re doing our best to manage the issues and just keep her going. As always, we just take it a day at a time. Anybody who has followed Sally or knows us is fully aware that Christmas has always been our favorite distraction, and will be especially this year. We’re finally taking Sally’s Make-A-Wish trip for Christmas. We’d been pushing this off for years due to Sally’s health, but were told we had to use up the wish before 2018. Our wish for Sally was to get her to the beach, something she always asks for all winter. We also wanted an island getaway, all through cancer treatment (and even at times now) we wished we could just escape to a remote island and get away from it all. Plus our family doesn’t do well with crowds, we don’t eat out, and we’ve got special diets to consider which limits our options. Originally we looked into a Caribbean getaway, but the two locations with American quality medical care were badly damaged by hurricanes. 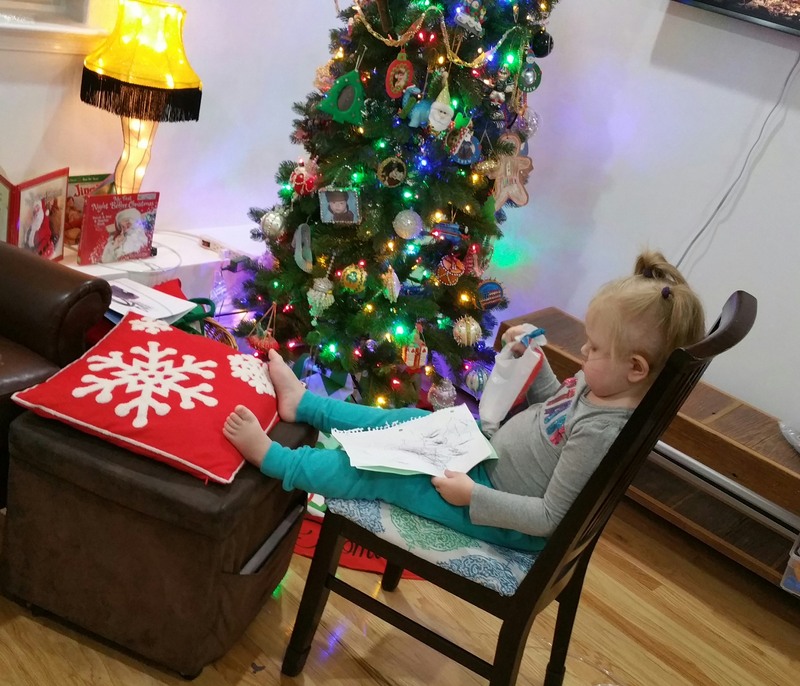 She’s “working” by the Christmas tree. So a busy couple months, lots of testing, but as always Sally continues to keep us and doctors guessing. It’s what she’s best at. It is great to see flashes of her personality returning this fall, but as she grows older her developmental delays continue to become more obvious. It’s really eye opening to see her around other 5-year-olds, to whom she can’t relate. 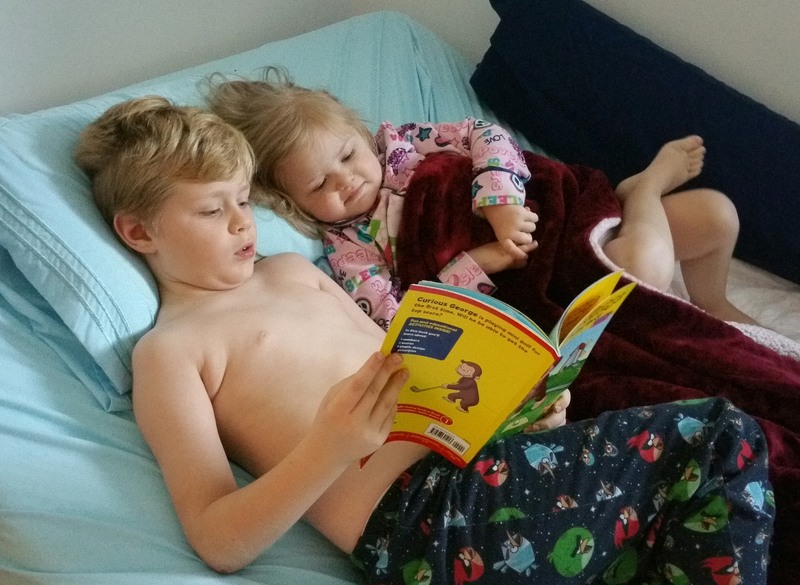 William recently noticed Sally struggles a lot more than other kids her age and even younger. At dinner the other night Thomas remarked how a three year old we know is smarter than Sally. We explained that this was a result of the seizures and cancer treatment, and that there’s a very good chance Sally will always be impaired. For the first time it really sunk in with him, and was heartbreaking to see the comprehension of what we were saying register in his face. He then determinedly shook his head and vowed that he wouldn’t let that happen, that he’d do whatever it took to make his little sister able to keep up with the other kids her age. We both responded that we hope he does. We all hope he does. We hope you all enjoy your Holidays, and wish everybody a great 2018! Please keep Sally in your thoughts and prayers. Enjoy your much needed and well deserved Christmas trip. Words can’t express how emotional this is. I wish I could wave a magic wand to cure all her ills and make her and your lives easier. Of course that is not possible. I do however, pray every night for her. Just try to keep her stable because the future may bring new forms of recovery like stem cell therapy. I wish you the best vacation ever. Captiva is a beautiful place and I pray the weather will be spectacular. I hope your Christmas is in every way a celebration of the love it represents. All our love and prayers go with you. Prayers for you and your wonderful family to keep up the good fight! Enjoy your well deserved and overdue vacation! Love to you all. Thank you for ending with the photos of Sally with her brother–the sweetest part to your whole blog. Have a Merry Christmas and may your island bring you all the peace you need and deserve! So enjoy hearing aBout Sally and the boys. Think of them often. Will keep all of you in my prayers. Love to you all and enjoy that trip, please! You are a remarkable family to go through all this on a daily basis and Sally is so fortunate to have you as parents. If you ever want to bring William over to play with Ryan so that he has some time to play, let’s coordinate. Maybe Sally too and she could socialize with Juliet . Praying that 2018 will bring some answers for Sally’s conditions and that she can make some good advancement. Hope you throughly enjoy your Christmas Vacation and get some peace and quiet. Prayers, love & hugs to you all and have a very Merry Christmas! My thoughts & prayers are with you. May you enjoy every minute of your trip.Sally is blessed to have William & Thomas at her side. They each get “Best Big Brother” award. God Bless you all. I pray for your whole family for strength to battle Sally’s issues and to enjoy the precious days when things are really good. I give thanks that you will be able to enjoy a special holiday time and wish for Sally’s ability to enjoy the trip. God bless you all. You are all always in our thoughts. Have the best Christmas ever on the beach!! You deserve some fun in the sun! Bless you and your Sally. I hope your Christmas escape is relaxing and beautiful! It breaks ones heart to read all the issues that Sally has and all she has gone through. No one knows what the future will bring. But we pray that God has something very special for Sally’s future. You both need to stay very strong and healthy. So this Make aWish Vacation is perfect for you all. Your boys are amazing on how they are aware of their sisters issues. Very special boys. Keeping you all, especially Sally in our thoughts and prayers each day. Have a Blessed Christmas as you enjoy each other. Praying for all of you and hoping that this vacation is an enjoyable one for your entire family. I will continue to keep Sally in my daily prayers. Enjoy your Christmas get-away!